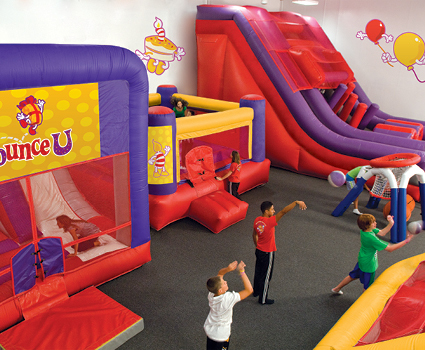 BounceU of Kennesaw is a part of the world's largest franchised network of indoor inflatable party and family recreation centers. It was started out of a love for kids, and was created to be the funnest, most happiest private party place in the universe for kids. Your BounceU of Kennesaw opened in 2007 and is owned and operated by a local couple that are both veterans. We have four children of our own ranging in age from 11-15. We are passionate about providing children a safe, clean, fun environment in which they can celebrate not only their birthdays but have a great time with their friends. With our military background and our love for kids we believe that we have combined our skills to drive successful store operations while utilizing the collective expertise of a national franchise network that has hosted tens of thousands of private parties over the last decade. After numerous military deployments, we truly believe in family-first values and providing parents a place to celebrate their children and watch them grow. One of the things we love most about BounceU is seeing families and friends just being themselves in a private-party environment, going a little wild, and sharing memories that will last a lifetime. We understand today's parents are busy! Party planning creates stress and that you want your kids to feel like the center of attention. We know you'd like your inflatable parties to be unique, exhilarating, and stress-free. That's why we're one of the very best party places for kids! As a couple, we are passionate about supporting our local military through the efforts of conducting donation drives to send our troops goodie boxes overseas. We work throughout the year with Make-A-Wish and also donate to local schools through our Bounce and Win program. 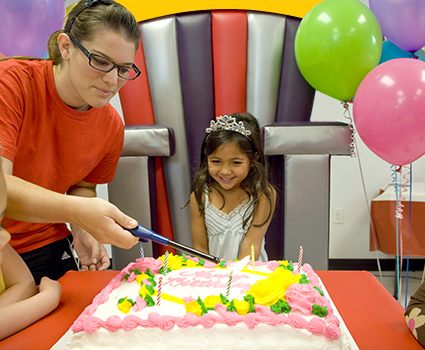 BounceU was recently named by "Parents" magazine as one of the "Top 10 Birthday Party Destinations" in the USA. We are so excited to continue to serve our community! We know that our popularity is due to YOU and since opening our store we've never stopping working hard to make sure that we provide you our customers and your children the very best experience possible. We work really hard finding the perfect staff to ensure that you have a great experience each and every time you visit us. Alot of effort goes into to finding party staff that has great attention to detail. But more importantly our staff loves kids!